Some Google applications need a lot of time to add even the most basic features. Gmail Chat added the invisible status in February and now this feature is also available in the Google Talk gadget and in Google Talk Labs Edition. Don't ask about the classic Google Talk client, which was last updated in January 2007. In a previous post, many people argued that it's not wise to add the invisible status because the instant messaging becomes less useful as more people become "invisible". "It's like one-way spying. If you're going to be online to see if your friends are online, at least have the respect to show other people that you're online. What happens if both you and your friend want to talk to each other, but are both on invisible? You'll never discover that you're online," commented Jyvyn. One solution for this problem could be to show different statuses, depending on your contacts. "What would be most helpful would be some sort of 'group block' or 'group invisible'. I have a number of work contacts that use g-chat so I need to be on and available, but often I am interrupted by friends wanting to chat and I have to ignore them or interrupt my work to explain I can't talk. If I could add all my work contacts to a group, and show my status to them as online, while showing everyone else away, invisible, or even offline - now that would be useful," said nauthiz693. Integrating Gmail's contact groups with Google Talk is an obvious next step, but this might require many months of coding. After all, adding the invisible status is probably the second most notable feature added by Google Talk this year, after the chatback badges. If I could add all my work contacts to a group, and show my status to them as online, while showing everyone else away, invisible, or even offline - now that would be useful. How strange, with this update the display picture part of the interface has disappeared, and I see the same has happened to you from your screenshots. Clicking where your display picture should be brings up the palate of available pictures, but you still can't upload your own, and the picture remains blank.. I totally agree with nauthiz693. I thought today was a day for a new Gmail feature, perhaps Gmail themes. Google pre-announced a mysterious new feature for Gmail. "On Thursday, June 5th we're going to be launching a new Gmail feature that we like to think of as a next evolution of 20% time. It's a change in our development process and in the way users will be able to influence Gmail's design." Well, where is it? I want to see this new feature already! Google invited some people for a "launch barbecue" today at 1:00 pm PDT, so we'll probably find more later today. This shouldn't be too difficult. I remember ICQ doing this WAAAY back in the day. You could, for each contact, select a box marked "Always show online" or "Alway Show Offline". These would let you determine who would still get to see you when you were invisible, and who would never get to see you. I was meaning :P Holy..
Then I don't understand why the status "Busy" is for? Busy means for me: I am Busy, I'm working, I'm occupied, Don't disturb unless urgent! I your bored friends don't respect the "Busy" status then they deserve to be ignored. Invisible is defibitely killing a part of usefulness of instant messaging. The most funny thing is that I get the annoying chainh/"funny"/viral/video emails from the same contact that has always status set on busy. They are busy all the time doing what? Busy to spam my mailbox (and all their contacts)?! I just got through and block the people I don't want to talk to at a certain time, and leave the ones I do. It takes an extra 30 seconds, but I unblock them when I'm finished with work and ready to chat again. I would rather a "selective" invisible feature, but I like that it's an option now. Should have been "go" through, sorry. yahoo has exactly that. it's called "stealth settings"
It'd be nice if they added selective invisibility already. I'm getting really sick of invisible mode. i cant understand how not putting invisible is even an option?there are some days you just want to chat with one person and dont need other disturbances,say at work.i like gtalk aside from the invisble thing,its one change they definitely need to make.ask yahoo. I would love a selectively-invisible option, as well, especially since we don't choose who can add us to their chat list. If they've got a Google account and you've exchanged email, you're easily visible if your status is anything but invisible. Hi is it possible somehow to block an email address in Gmail? i know i can create a filter so that the mails go directly to my trash can but i want to block the emails from coming into my account from a particular address. I dont even want them in the thrash can, And also maybe if possible also have gmail send an email to the sender that the message could not be delivered like in Hotmail it gives you that message when your inbox is full and someone sends you an email. Comment moderator this is not a spam, i have typed again so that users can directly click on the site rather than copy paste. Invisible status is not a problem because most people don't set to invisible. If you really want to be sure to talk to someone, you'll know not to set yourself to invisible. So it's a false problem, Jyvyn. 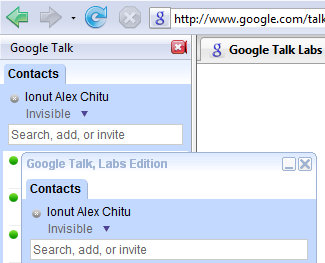 I have used Google talk labs edition, because I needed the invisibility feature! But I found that, this edition has some problems and gets restarted anytime! This is really not expected! This does not happen, only on my computer, but also on my friends' computers! Please find the problem and its solution out...please! What can I do ? Is there any way to get this working. I do not want to use Firefox just for this reason. Well what about the people who just want to see email notifications without opening a browser? These people DO want to use Google toolbar as well, but only when they open the browser not when they are trying to work on something else. Gmail notifier has known issues with Google Toolbar. Therefore, if they install google toolbar and Gmail notifier, then they will not be able to sync their book marks or history and blah blah with the google account, just because notifier is installed. In this case, if there had been an invisible option in the Gtalk client, then it would have been good. If someone wanted to talk he would come online, otherwise he would be simply see the popups of emails. Does it work to be invisible in Gtalk ? thanks, i like invisible status. If you don't want to be invisible, don't go invisible. Taking away the ability to become invisible is a terrible idea, but unfortunately Google has implemented it. The reason I don't use Google Talk anymore is because they took away the ability to become invisible, and Pidgin isn't working with the 2-factor authentication, even with application specific passwords.